The metaphors we live by are different in each era, and tell you about the social movements shaping this moment. In the time of Snowden and Zuckerberg, we get our metaphors from Silicon Valley. The ‘fork’ is one such concept, originating in this case from the world of open source software development. Initially considered a negative occurrence, a fork is when someone creates a new version of an existing project that takes a different direction than the original maintainer imagined. A new style of open source collaboration, embodied in the popular code sharing platform Github, encourages forking. In Github, collaboration starts by creating a fork of a project, and adding changes to this fork. Then one either contributes these changes back to the original depot (if they accept it), or one goes ones own way—a fork proper in the traditional sense. There is a lot to be said about this ‘bazaar’ style development model, and how a pragmatic view on originality and authorship and an embracing of redundancy can make for a culturally rich ecosystem. These ideas are inspiring enough to see how they could also work outside the realm of software development. But when it comes to type design, one need not look to software development. To see how building upon existing creations makes typographic sense, one can look at type design history itself. Two seminal typefaces of post-war graphic design are described by their own creators as improvements upon existing fonts. The first notable attempt to work out the norm for plain letters was made by Mr Edward Johnston when he designed the sans-serif letter for the London Underground Railways. Some of the letters are not entirely satisfactory, especially when it is remembered that, for such a purpose, an alphabet should be as near as possible ‘fool-proof’ (…)—nothing should be left to the imagination of the signwriter or the enamel-plate maker. In this quality of ‘fool-proofness’ the Monotype sans-serif face [Gill Sans] (…) is perhaps an improvement. On Typotheque, Ben Archer reviews the way in which Eric Gill takes Johnston’s typeface as its base, and then tries to achieve more ‘fool-proofness’. For example, in letters like the b, d, p and q, which consist of stick and a belly, so to say, Gill connects the stick directly to to the belly (‘flattening of the bowl’). At the same time, Gill is not entirely consistent in this effort as he adds additional curves (cusps) to some letters (the a) while removing them in others (the i). In Archers’s opinion, this means Gill did a bad job in re-adapting the design. One can argue with his reasoning—consistency is not necessarily what makes a great typeface, and having a set of consistent letter shapes are by no means a guarantee that these letters will work well together as a typeface. Yet it is the idea that Gill Sans represents a proposition of improvement over an existing typeface, that interests me. And we can now all try and do a better job than Gill, because Greg Fleming released the source files for Justin Howes’ digitisation of Johnston’s typeface under an open source license as Railway Sans. ‘In 1956, Edouard Hoffmann, of the Haas Type Foundry in Switzerland, decided that the more natural typeface, Akzidenz Grotesk, needed to be reworked for a new century.’ (source) The new typeface comes at the exact right moment to be adopted by the burgeoning Swiss International Style, and another famous 20th century typeface, is born, Helvetica. If forking defined 20th century type, one would imagine that in the digital era the promiscuous forking of typeface designs would take an ever higher flight: typefaces are distributed in a form that is extremely easy to manipulate and the tools to do so are readily available. Yet looking through Typographica’s favourite typefaces of 2012, there is only one typeface that is explicitly based on another popular digitally available typeface: Stanley, based on Times New Roman. Apparently, type designers prefer to take their inspiration from the pre-digital era: they work from Vienesse street signs, a 1909 plain Dutch typeface in which a Piet Zwart pamphlet was set, the work of an 18th century Parisian stencil maker who had sold all his copper plates to Benjamin Franklin, and ‘a very little known typeface issued in 1913 by the Dresden foundry Schriftguß AG Brüder Butter’. Why is it then that all these designers base themselves on pre-digital sources. Why don’t they work from existing digital font sources? Or, at least, do not do so openly—it might be the case that they already do so, as there is really no way to know if a designer started of with an existing digital font. One of the reasons the fork has flourished in type design is because copyright protection is very weak on typefaces. Like baseline describes in I like tight pants and I want my generic font medicine, it is not the design itself, but only the final digital font file that can be copyrighted. 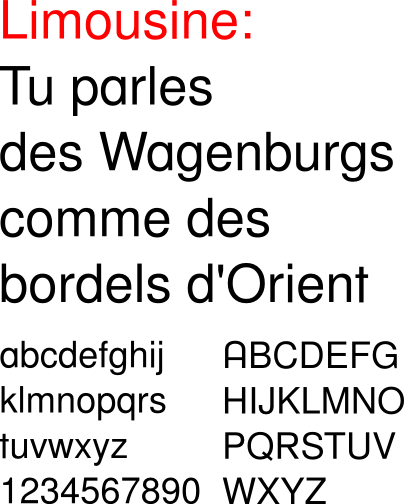 This is one of the reasons why type designers choose to work on pre-digital revivals: the practical consequence that they do not have to care about any copyrights in the original. Another element is that in working from pre-digital sources, typographers underline the need for their skill set, and stress the labour involved in the process. Ricardo Lafuente is onto something when he borrows Fred Smeijers’ terminology, to describe type designers efforts to separate type designers into “true” type designers and mere font tweakers. At least, with a digitisation, it is clear that a mere ‘tweak’ cannot suffice. Everyone who has ever digitised a font knows that it is a lengthy and laborious process to interpret the blurry analogue impression of ink on paper into the squeaky clean logic of PostScript points. Traditionally type design has been a discipline tightly coupled to the printing industry. To get a job as a type designer, one needed to work in the industry, because they paid for the production costs. Nowadays, the means of production for type design are practically free. Type design then, like graphic design, visual art and music, becomes a field with a very low barrier to entry. And because creative professions are fun, and are deemed to be full off rewards, many flock to these fields, leaving a situation where the offer highly outnumbers the demand (Hans Abbing wrote a great book on this: Why are artists poor?). When one has invested in such a discipline, for example by following an education at the KABK in Type&Media or at the University of Reading, or by joining an organisation like the ATypI, one has all the interest in defending the virtue of ‘professional art’ versus the amateurs. One way to do so is to distinguish oneself from enthousiastic amateurs who distribute their work for free on sites like dafont, and who are not always clear about the progeny of their work. Starting from existing digital typefaces, then, would seem uncomfortably close to a ‘font-tweaker’ approach, blurring the lines between the professionals that know the craft, and the rest of the human population that knows how to open up a font-editor. In software, it can be confusing to have many forks of one project existing, because it is probably practical to use just one version of the package. Cultural artefacts like typefaces, however, can more easily exist in an abundance of similar guises, because they coexist. Both the inspiration (Akzidenz) and the inspired (Helvetica) can be used by a contemporary designer. Or one might prefer to use a sibling like Univers, that shares the Akzidenz inspiration but takes it somewhere else. There are several versions of Johnston’s typeface available that one could use instead of Gill Sans, and, according to Archer: ‘FB Agenda (1993 by Greg Thompson), Bliss (1996 by Jeremy Tankard) and Fedra Sans (2001 by Peter Bilak), are some of the recently-produced typographical riches that all owe some part of their provenance to Edward Johnston’s sans serif lettering for the London Underground in 1916’. I know Gert Dumbar, his students and the Zeebelt theatre have made a typographical cabaret show about the relationship between Akzidenz and Helvetica, in which the poster seems to tell of Helvetica as an imposter. I can not seem to find any info on it online though. Limousine by OSP, a fork of the Free Sans. An experiment in creating the maximum possible change in character of a typeface with the minimum in modifications. I like how Martin Majoor and Ben Archer use the argument of consistency in diametrically opposite ways (Gill is bad because its inconsistent, Helvetica is bad because it’s consistent), but that they find the exact same reason as to why these typefaces might somehow have enjoyed some success: Monotype’s formidable marketing machine. For a much more nuanced critique of Helvetica and similar mid-century sans serif faces, see Nick Shinn’s The face of uniformity (pdf). He posits how the typefaces we use to symbolise ‘modern’ and ‘neutral’ were all designed long ago, yet continue to exist because the image they project work well in globalised brand strategies—companies trying to be all things to all people. Together with the economies of scale (Helvetica or one of its forks is bound to come for free with your computer and/or your design software), this makes it harder to have a typographically diverse landscape that embraces local typographic cultures. Isn’t one of the reasons for the small number of designers basing themselves on existing digital fonts, that there not many fonts that allow for this? The End User License Agreement most of the time does not even allow for private modifications by the end user, let alone redistributing modified versions. There is a growing existing body of Open Source (Libre) fonts available, on sites such as Google Web Fonts and the Open Font Library. As the availability to modify and redistribute are a hallmark of Open Source, these typefaces do allow forking. The Ghostscript fonts baseline writes about, and Railway Sans, mentioned on this page, are available as open source, and one is free to base oneself on these fonts for new creations. The only catch is that that the most widely used of such Open Source License for fonts, the SIL Open Font License, stipulates that if one bases their font on a SIL licensed font, one needs to license it likewise. This is called ‘copyleft’ (or share-alike, in the terms of Creative Commons). The idea is to create an ecology of sharing. Yet also if the ecology of sharing does not fit into your (economical) plans, there are alternatives. The Apache 2.0 license does not have a copyleft requirement, and among others, Google’s Roboto, Droid and Open Sans families and Firefox’s new Fira typeface are all available under this license. Which makes some kind of sense. If you are hoping to make money with your typeface, why would you let someone else release a version built upon your work? Point taken—whether it makes economical sense to release a font as Open Source is surely dependant on the circumstances. But it is not just a matter of common sense economics, I think there is a real cultural bias in the type design world against allowing reuse of the font (siding oneself with the ‘font tweakers’?). They are not making money of the font in the first place, so why are they not allowing reuse? There must be other reasons as well besides making money. I still believe that drawing outlines over existing designs is neither interesting activity, nor very educational. I'm not opposed to it—far from it—but if you asked me to do it personally then I would find it to be utterly dull. Every fork, starts with a copy. There's a telling video (it's on YouTube somewhere) of Erik Spiekermann talking at some length about how part of his approach to type design is to take part in an intensive amount of 'looking at' a specific existing typeface(s), to immerse himself in their forms, and then, when he designs himself, all those forms will come out in some way, as his own designs. I'm unsure why Spiekermann thinks this is worth explaining. But he may be saying that if a form of copying takes a lot of time, study and academic know-how, then let's not call it copying.